Cutting dovetails on small or large projects has just gotten easier. 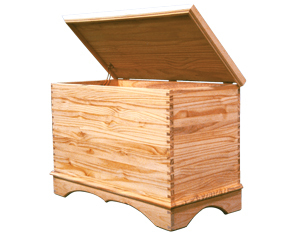 From traditional dovetails to the antique look of wide spread dovetails, The Dovetail Wiz™ makes it simple. The hardest part about cutting dovetails is marking and cutting the matching angles to one another. Fortunately, we have done the math for you and milled the exact cuts that need to be made in this easy to use dovetail jig. 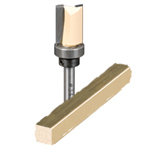 This dovetail system works with precision bearing guides on the shank of the router bit instead of using those hard to center brass bushing guides. Since the bearing is already center on the bits, there is no slop, no wear and no waste, making set up fast and easy. Unlike other templates you have seen, our jig will work with different thickness of stock from 1/2" to 3/4" thick. 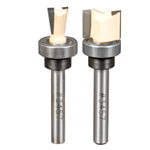 (Optional router bit sets are available for thinner stock or box joints). It also does not limit your your stock width, it's as simple as making your first cut, then slide the jig down, realign and make your second cut. Or simply attack an Add-On Jig (Sold Separately) to your Dovetail Wiz™ to create a longer jig for any size project. This means the types of projects you can do with this jig are virtually endless! 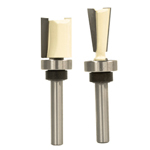 The connector tabs also except the Micro-Adjuster (Sold separately) to super fine tune the fit of your dovetail joint. 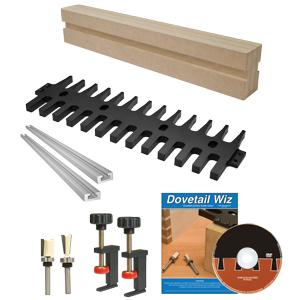 The Dovetail Wiz™ Complete Package includes everything needed to get started creating your next dovetail project! Assembly is quick and easy and you'll be up and running in no time. This package comes in both 15" and 30". This jig can be tightened in a vise (as seen to the left) or used with a router table. Note: Red Clamp Pads Not Included. Dovetail Jig Instructions & Dovetail Mounting Block Instructions can be found on PDF Instuctions Page. If you are building a large chest or maybe even a dresser you’ll need a larger dovetail jig setup. With the unique design of the Dovetail Wiz, you will be able to add as many Aluminum templates (sold separately) as you want. Each jig and add-on kit template have specially designed tabs on each end that allow you to attach as many jigs as needed for any length of cut. This gives you total control no matter how big your project is. Used for cutting dovetails in stock thicknesses ranging from 1/4" to 1/2" in thickness. 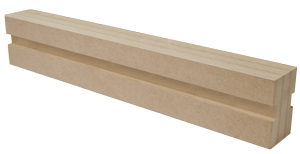 These two bits are the replacement bits for the Dovetail Wiz Jig for cutting standard size dovetails on stock ranging from 1/2” to 3/4” in thickness. 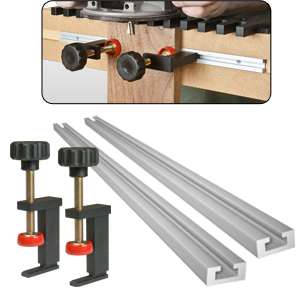 Used for cutting Box Joints in 1/2"stock thicknesses only. Used for cutting dovetails in stock thicknesses ranging from 1/8" to 3/8" in thickness. 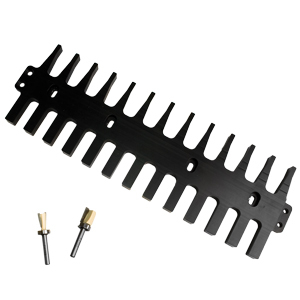 Get all the accessory bits you need for the Dovetail Wiz in one convenient set. 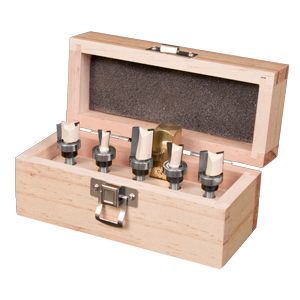 The set includes the Small Router Bit Set, the Mini Router Bit Set and the Box Joint bit with a 1/2” brass set up bar. 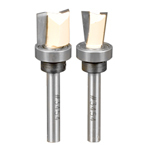 Along with the standard router bit set that comes with the Dovetail Wiz you will be able to cut most any thickness stock when it comes to making dovetail joints. Made from 3 pieces of laminated MDF, this mounting block provides the perfect platform to mount the Dovetail Wiz template. It also gives you backside support during the cutting process which virtually eliminates tear out. The block is pre-milled with a slot that accepts 1/4” x 20 t-track (sold separately) for use with t-track clamps (sold separately). Available in 15” or 30” lengths. No more need for annoying, bulky c-clamps or f-clamps! 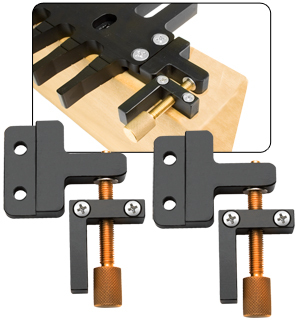 The clamping kit includes two clamps and two t-tracks that are designed to be used with a mounting block. 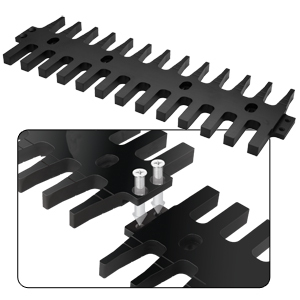 After the t-track is installed on to a mounting block, the clamps slide right into the track and are completely adjustable from side to side to accommodate most any width of stock. Once the stock is in place, slide the clamps up against the both sides and secure. Adjust your jig alignment to perfection with the Micro Adjuster. Attach the Micro Adjuster to the both end tabs of the Dovetail Wiz, secure the “L” bracket to the mounting block and your ready to Micro Adjust to the exact position you need. 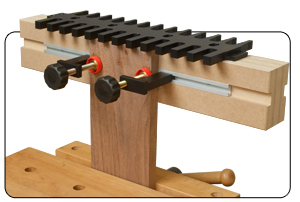 The Micro Adjuster can be used with both the 15” and 30” Dovetail Wiz set ups. Note: Micro Adjuster Only, Dovetail Wiz and Block not included. Learn how to use the Dovetail Wiz from start to finish with the complete instructional DVD. The DVD contains step by step instructions on how to set up the jig as well as how to make different types of dovetail joints.